to serve the Methodist Church of Samoa and abroad faithfully and effectively. Four years is put in place to complete the number of required courses, and to train candidates with other extra ministerial responsibilities such as leadership, conducting Methodist worship services, and sermon training in a particular or on hand experience. articulate the implications of Christianity and Methodist discipline in moral and spiritual life. Practically capable to lead worship services and other services of the Methodist Church in Samoa. Entrance examination on selected Books from the Old Testament and New Testament, plus and English/Essay examination provided by the Institution. Candidates are only accepted for the Entrance Examination upon the endorsement and approval of their respective synods (refer Policies and Guidelines on Entrance and Admission). Ministerial Conference of the Methodist Church in Samoa has the right to refer candidates directly from the authority of the Conference to be enrolled in the Diploma Programme. 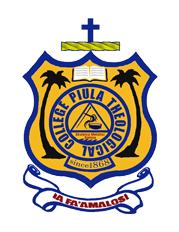 Special consideration will be given by principal and staff to overseas students, who do not wish to become ministers of the Methodist Church of Samoa at the completion of their studies. To graduate with a Diploma in Theology, the candidate must complete 36 courses with a minimum of 50% pass mark. However, a student can only be awarded with a Diploma in Theology when he successfully take part and complete the Fieldwork during the fianl year of training (see Fieldwork Handbook). A requirement of discipline as a mandate of the Methodist Church in Samoa for the training of its ministers is crucial and will not be overlooked. The Principal and staff therefore have the authority to withdraw the award from a candidate that cannot respect or ignore the disciplinary and cultural protocols of becoming a Methodist Minister in Samoa.